The IC-6T packs proven materials and technology into a installer-friendly UL-certified loudspeaker with an integrated back can and multi-tap transformer. The two-way IC-6T features a swiveling Tractrix® Horn with aluminum dome compression driver which allows contractors to direct the sound to specific areas more accurately than fixed position tweeter designs minimizing disturbing sonic reflections even when the speaker is positioned in a less-than-optimal locaton. Other features include an injection-molded woofer cone Santropene® surround cast polymer woofer frame and screw-down terminals. As a benefit for distributed line applications the IC-6T features a 60-watt 70/100 volt multi-tap transformer. A single switch for the 8-ohm bypass and multi-tap setting is conveniently located on the front baffle. 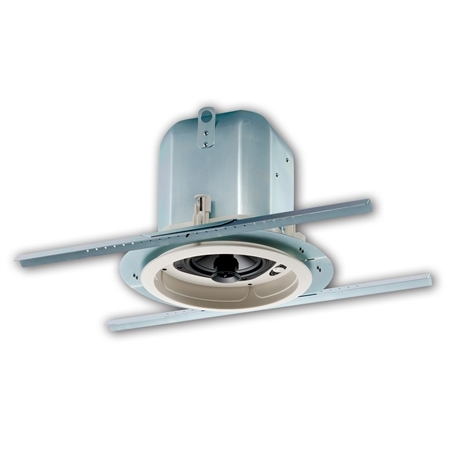 The IC-6T is shipped complete with a tile bridge for installation in a suspended ceiling or wherever additional reinforcement of the ceiling material is required. While no longer in production the IC-6T speakers are still owned and listened to by Klipsch fans around the world. To connect with other people who are passionate about audio and interested in Klipsch products visit our open forum bulletin board.